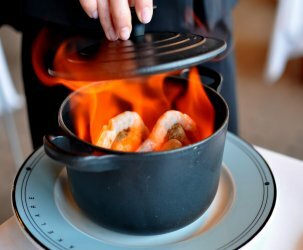 Ben Bailly, one of my favorite chefs in Los Angeles, recently left his post as the executive chef of Petrossian in West Hollywood to helm the kitchen of Frîache in Culver City. Chefs move up the ranks and change jobs every day in L.A., but rarely do I feel compelled to check out their new digs straightaway. However, with Chef Bailly things were markedly different. 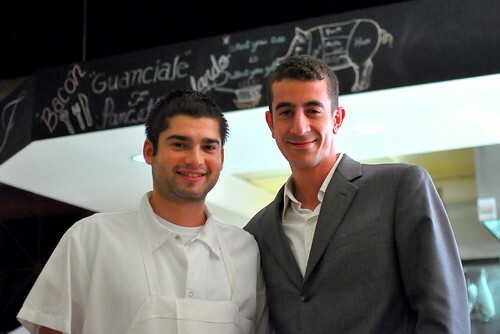 The Astronomer and I, along with the lovely Diana Takes a Bite, dined at Fraîche a month after Chef Bailly took over the kitchen and revamped the rustic French and Italian menu. Diana arrived moments before we did and was sipping on a cool glass of wine when we greeted her at the table. 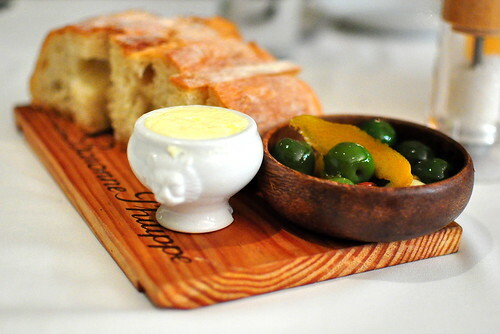 She was careful not to nibble on the bread, butter, and olives until I had taken a proper photo. Whatta gal! Even though we were planning on a booze-free meal, sommelier Paul Sangoletti insisted on providing cocktails and wine pairings for our party. 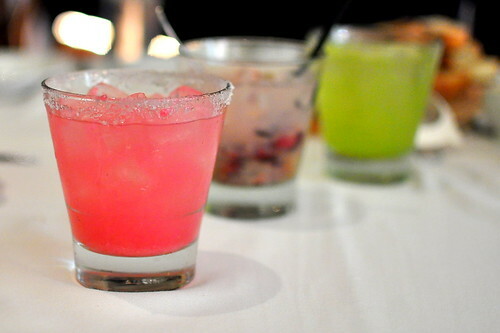 We started off with three market-driven libations featuring (left to right) beets, red grapes, and basil. The grape-infused concoction with vodka and elderflower syrup was too strong for me, but the ones with beets and basil were just right. Sipping on seasonal cocktails makes drinking feel so virtuous! 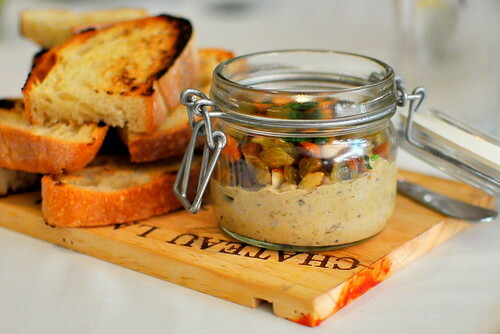 The first course to arrive was the Eggplant Caviar ($8) topped with raisins, marcona almonds, and chives. The spread was accompanied by a stack of toasted bread. While my vegetable-loving dining companion was up in the jar’s grill, The Astronomer and I each had a single serving. The chunky eggplant spread was perfectly nice, but with fourteen courses on deck, we had to eat strategically. Course number two was a Hamachi Tartare ($14), which was inspired by a lobster dish that Chef Bailly mastered while working under Chef Joël Robuchon. 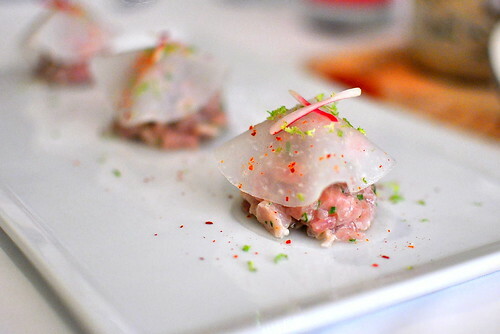 The tiny cubes of fish were topped with shaved turnip, lime zest, and Espelette pepper. The zest really made this dish pop. One of the strongest and most memorable dishes of the evening was the Vitello Tonnato ($14). 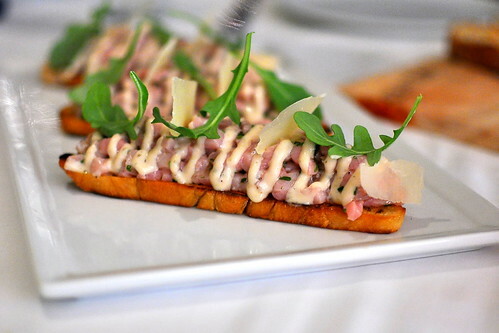 I have a weakness for raw preparations, and this veal steak tartare with arugula and Parmesan really impressed me. The meat’s robust flavor, which Diana likened to that of hamburger, was unexpected and totally delicious. Toasted crostini provided a sturdy base and effective vehicle. The veal tartare was followed up by a trio of salads, including one with baby beets, mizuna (water greens), ricotta, Cara Cara oranges, and pistachios ($12). The combination of flavors was well matched. 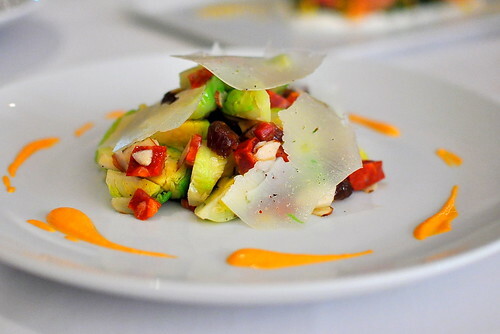 Next to arrive was a Brussels sprouts salad with Manchego cheese, chorizo, dates, almonds, and piquillo pepper vinaigrette ($12). All three of us were diggin’ the sweet, spicy, and savory profile. 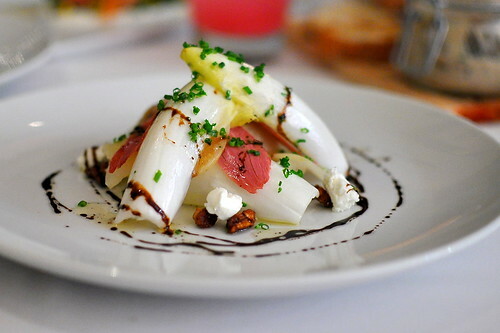 While all three salads were very tasty, our favorite was the unassuming-looking Belgian endives with duck bresaola (aged and air-dried salted meat), quince, candied pecans, goat cheese, and truffle vinaigrette ($14). Eating three plates of farm fresh veggies was just the thing to assuage the mild guilt we felt after enthusiastically devouring a baby cow. The house made agnolotti ($16) signaled the transition from starters to mains. 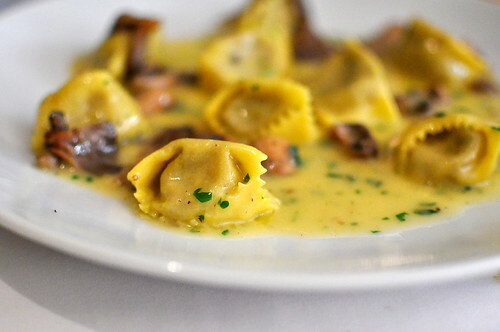 Stuffed with wild mushrooms and bathed in truffle butter, the little parcels had a fine bite to them and an unmistakable earthiness. Along with the agnolotti, the Chef sent out a beautiful plate of foie gras ($18). Seared to perfection, the fatty lobe was accented with frisee, cubes of rhubarb gelee, pomegranate arils, and house made Speculoos. 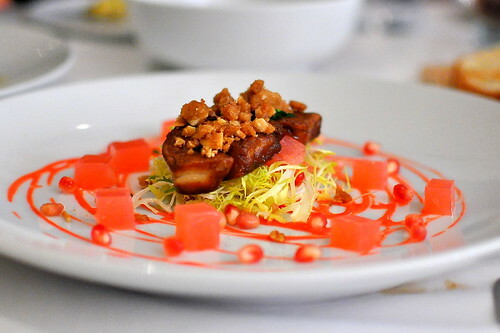 The accouterments tamed the foie gras’ richness and added fun elements to the plate. 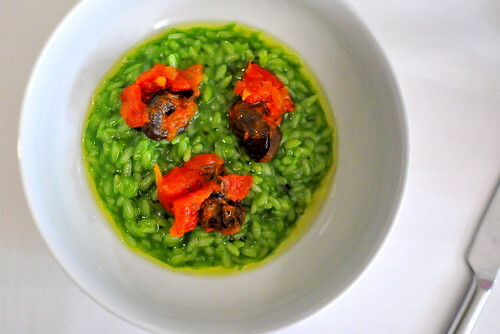 Another one of my favorite courses was the basil risotto ($14) with escargot, lemon, and tomato. Each plump snail was wrapped in a tangy tomato blanket. 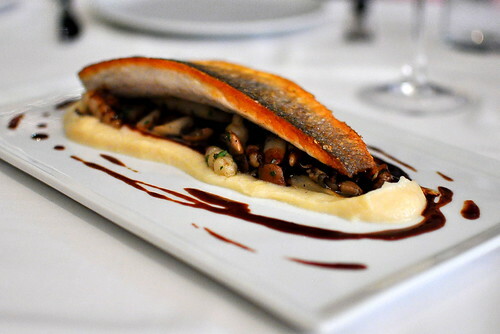 The Astronomer and Diana did most of the heavy hitting when it came to the crispy Loup de Mer with sunchokes soubise and wild mushrooms ($26). I snagged a piece of its tautly fried skin but didn’t delve much further to save space for the pasta courses. Noodles > cooked fish. The final three savory dishes featured luxurious handmade pastas—the stuff my dreams are made of. Even though we were all seriously stuffed, our forks couldn’t stop twirling up the squid ink taglieneri ($22) with Maine lobster, cherry tomatoes, and basil. The lobster was plentiful and expertly cooked, while the noodles were tender and flavorful. 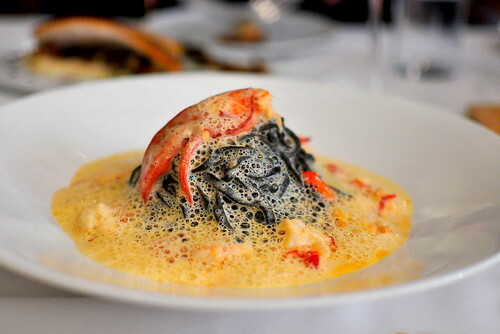 It’s rare for lobster to be upstaged on a plate, but in this case, the taglieneri was the standout. 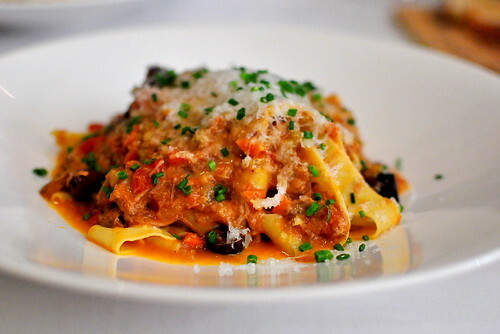 And finally, a hearty lamb pappardelle ($18) accented with tomatoes, olives, and Onetik goat cheese. I wasn’t sure about the black olives initially, but I was grateful for the briny punches toward my final forkfuls. 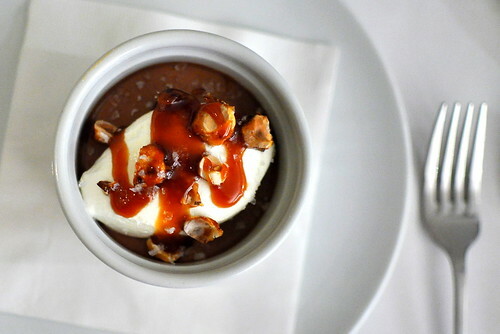 For dessert, Chef Bailly sent out a manjari chocolate pot de creme ($8) topped with whipped cream, toasted hazelnuts, coarse salt, and caramel. Reminiscent of Pizzeria Mozza‘s famed butterscotch budino, this smooth, sweet, and salty pudding totally hit the spot. 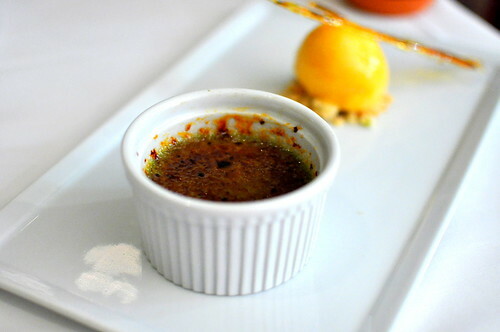 And just to be absolutely certain that our stomachs were pushed to maximum capacity, he also sent out a pistachio creme brulee ($9) with apricot sorbet and rosemary crumble. 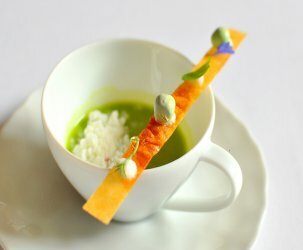 According to the Chef, pistachio, apricot, and rosemary are often paired together in Mediterranean cuisine. I found the distinct nuttiness of the pistachio more pronounced in this version than in previous ones that I sampled at Petrossian. Mmm! A special thank you to Ben and Paul for showing us a most spectacular time this evening. Fraîche exceeded my sky-high expectations and I cannot wait to return for the truffle burger and of course, more noodles! Long live the communal wine glass. oh man the food looks great! can’t wait to try it. now i’m super hungry and need to decide between my bowl of cold cereal or some instant ramen…oh such is life…..
I’ve been waiting for this one! 🙂 Makes me hungry for Ben’s pastas all over again. Twirl twirl twirl! Let’s christen another communal wine glass over there soon, k? Lucky, lucky you…what a fantastic meal! If I lived in the area, I would book right away! thanks for posting these beautiful pictures. OMG! 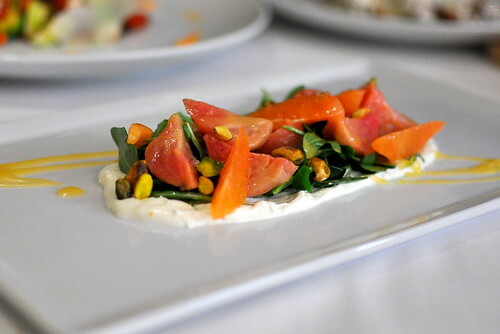 I am reliving my amazing meal at Fraiche. I can’t wait to go back. Photos are gorgeous! I was told by a server at Jar that “Pizzeria Mozza’s famed butterscotch budino” is actually made from Suzanne Tracht’s butterscotch pudding recipe. This article lends a bit of credence to the theory, pointing out that both Nancy Silverton and her Campanile/Mozza protege, Dahlia Narvaez, spent some time at Jar, where Narvaez apparently first made the budino. Whether the recipe originated with the Mozza folks or the Jar folks, it seems likely that Jar’s pudding and Mozza’s budino are the same dessert. The dining room/patio is so dim…but no one can tell in these pictures. Beautiful photos as always! 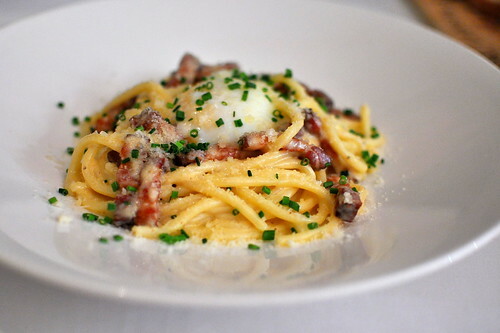 Totally agree with the pastas, especially that carbonara! This place sounds absolutely phenomenal! Gorgeous! How are your photos so bright?! 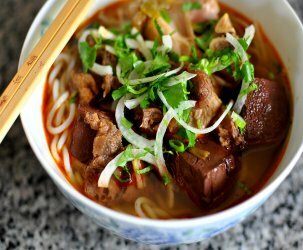 What beautiful dishes and photos! I wish I could try out BB new menu! Beautiful photos and great blog – makes me want to jump on a plane! This meal looks delicious. 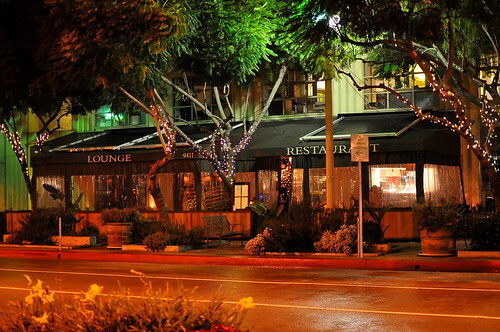 I am visiting my sister in LA in the spring and am looking for places to try. I will look into this restaurant for sure. Great post Cathy. I’m so glad you enjoyed the meal! I can’t believe you got the pictures to turn out that bright….great work!